Now, you'll see by the photos, that I have, indeed, succeeded in creating the intended plaid and have gone on to doing it again, with two other colourways. And, given that Michaels still has them in stock, I'm not stopping with this magical yarn yet, because there are a couple more colourways that I really want to try out, specifically a black, white and grey one and a blue one that has some coral in it. Since I could find no photos of this yarn worked up online, each new colour combo is a complete surprise, in that, by looking at the skein, you have no idea exactly what the plaid will look like. 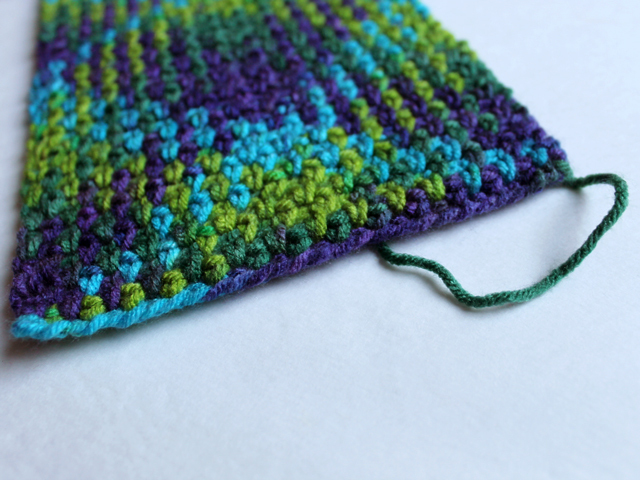 It's really fun to see, as it slowly reveals itself, after several inches of crocheting is complete. Well, there is the tiny photo on the label, which I'll admit to analyzing with a magnifying glass, in an attempt to count how many stitches there are in each row, because, with all due respect to whoever wrote the instructions on the packaging, no matter how much I tried, I simply could not get the desired results by following them as written. 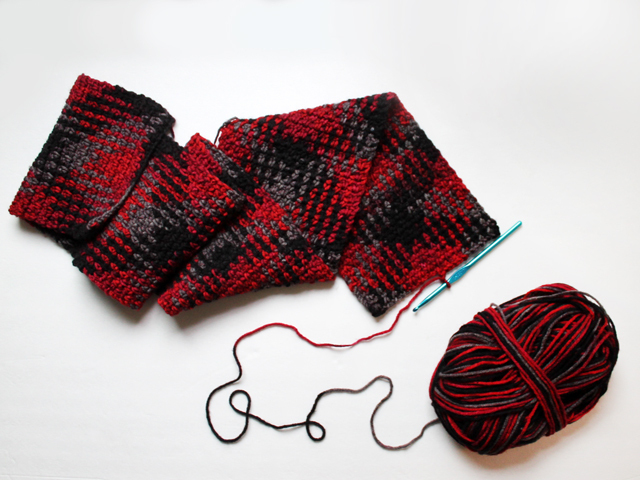 The main inaccuracy, which makes all the difference, is the width of the completed scarf. The instructions say it should be 7 inches (17.7 cm) wide, when my finished results were 3/4 of an inch shorter, or 6 1/4 inch wide. 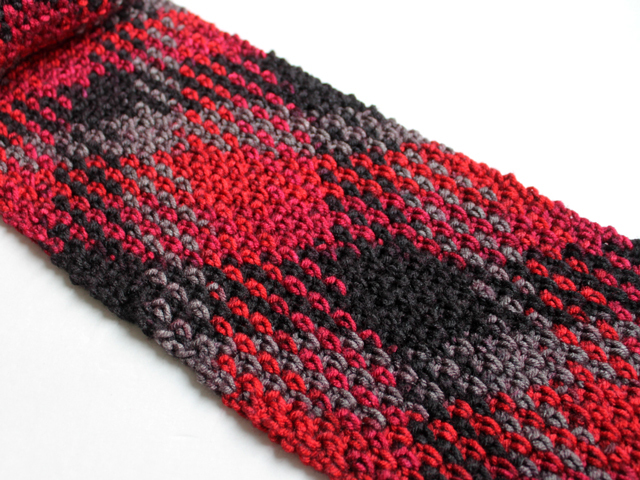 Sure, when crocheting a scarf a 3/4 inch difference in width only means a few stitches, but that's the clincher in this case ... this yarn is designed in a way that even one extra stitch in each row, will make the plaid pattern impossible to achieve. Even, a slight change in your tension, as your proceed, will knock the pattern out of whack. 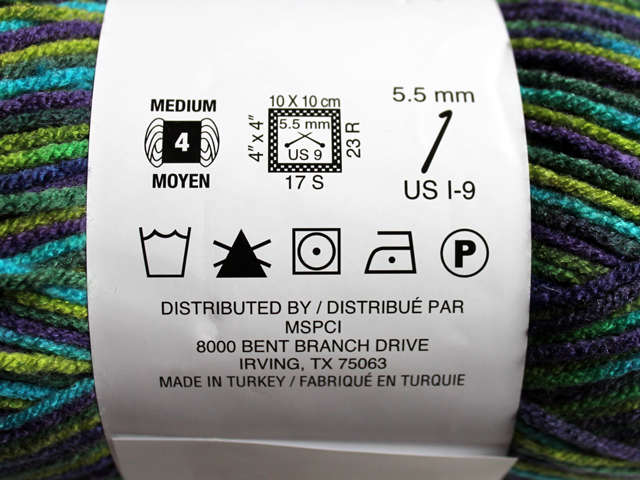 I believe that it's this absolute requirement of precision and confusion with the instructions that has frustrated crocheters, leading them to rate the product on the low end of the scale. But, it really is such a fun and interesting yarn to work with, that I encourage you not to give up on it! Instead, please give my guidelines a try, as I really think we crocheters will be missing out if the brand decides to discontinue the product because it's such a challenge to use. 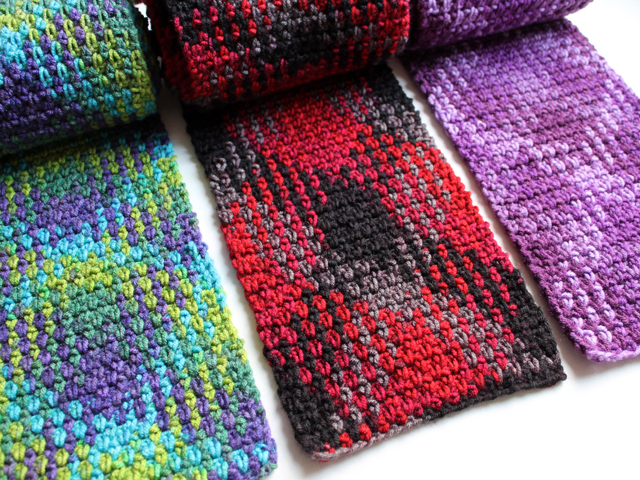 It is so worth persevering, as the results are really unique and cool looking, and without any weaving in of ends which is everyone's least favourite part about crocheting with multiple colours. The skeins are very generous at 200 grams, however, the image is deceiving, in that the flap that goes over the model's shoulder will end a few inches down her back. I found there is enough in one skein to make a cowl scarf for an adult, or a fringed one for a child. I used one skein and about a half, to make a scarf that will wrap around my neck and have some length to hang down on either end. NOTE: It's important to line up and attach a new skein so that the exact measurements of the colours changes carries through. This also applies if/when the manufacturer has begun a new piece within the skein, you know, when they tie a knot within a skein. 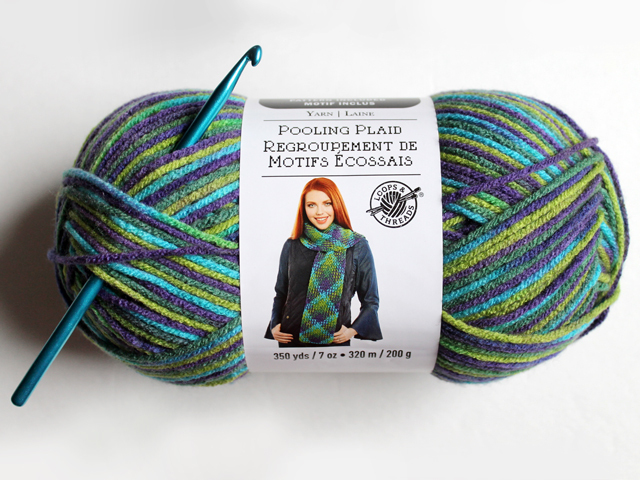 If you come to a knot, undo it and line up the colours so they exactly match the pattern/lengths of the previous piece, before you continue, or the plaid pattern will not continue properly. Each colourway has four colours within, however, in some cases, the shades are very close, as in the red one ... there is a brighter red right beside a more burgundy red, which are very hard to tell apart. The ones with four very distinct colours (such as the "Peacock Parade" - lime green, dark green, purple and teal) are easier to use, as you can better see what is going on. 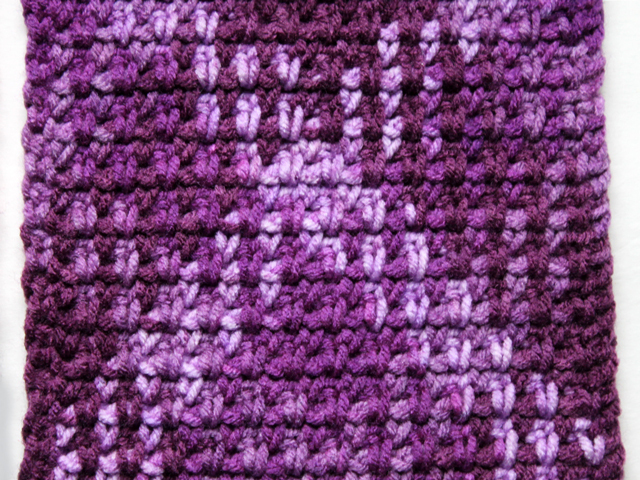 The first row (after the chain) is a Single Crochet Stitch into every second Chain Stitch, with a chain-1 between each. 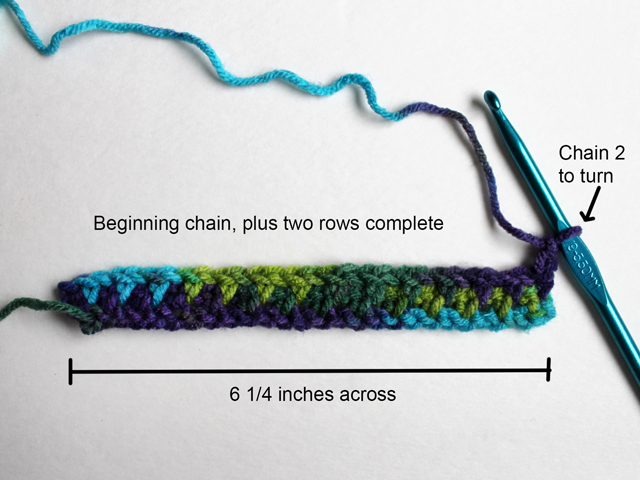 There will be 14 Single Crochet Stitches across each row, with 13 chain-1 between each, plus the beginning Chain 2 turning part. 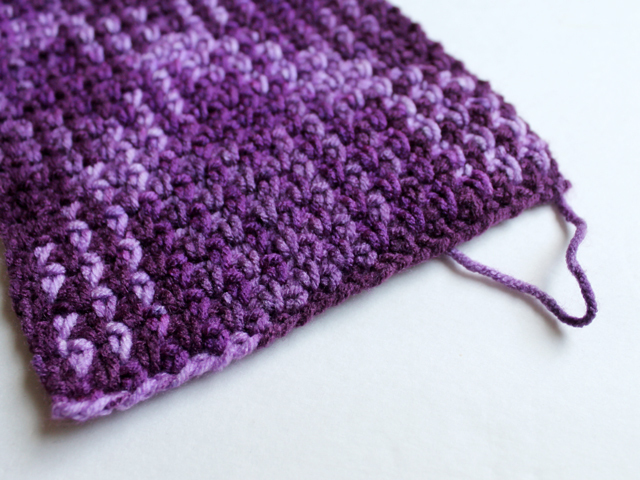 The Single Crochet Stitches go right through the "Chain-1 holes" in the previous row. The actual crocheting part could not be easier. 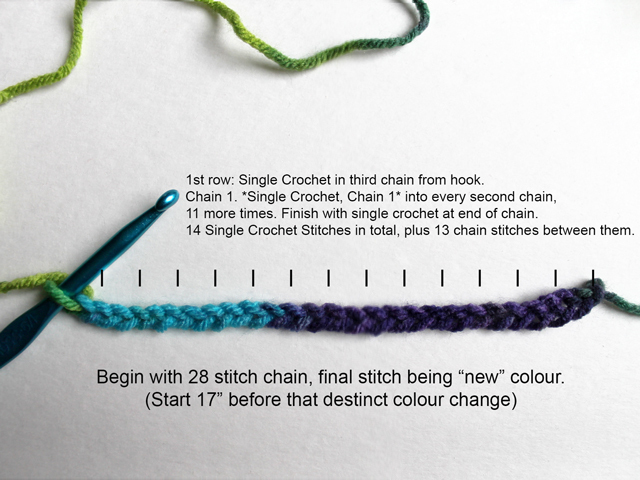 It's just a repeating of a single crochet plus a chain, across the length, ending with a single crochet into the "ch2 turning part" of the previous row. 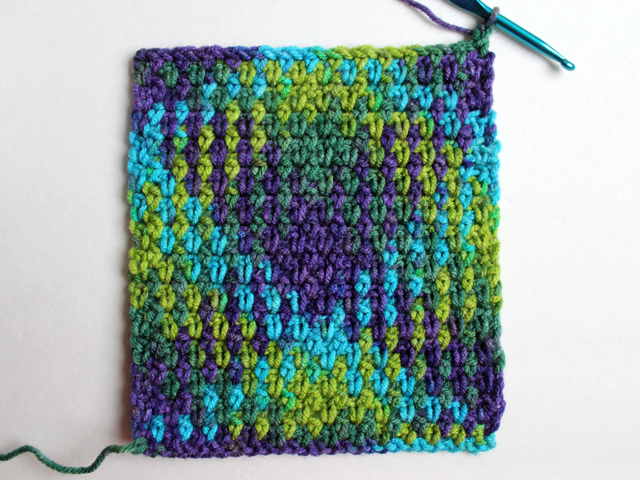 The colour pattern is not easy to see at first and will take several rows to become visible. 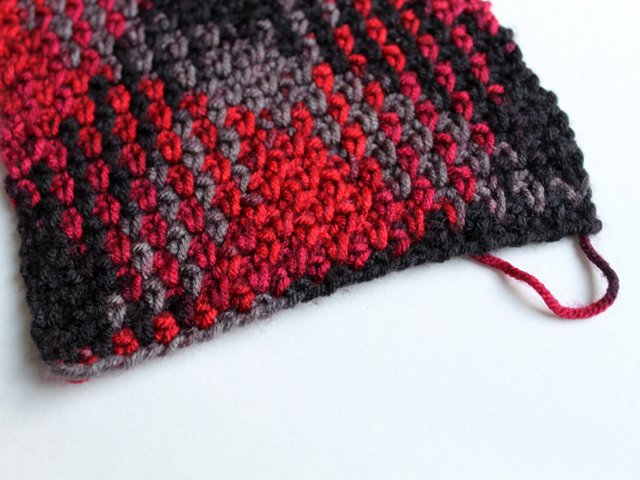 The variance in colours is achieved by the combination of rows back and forth (so it only works on a strip, turning at each end, rather than going around, as you would when making a hat, for example). I think that's all that requires saying, so I'll leave you with more photos and best wishes for wonderful results! At this point, the red one is still here with me, while the "Peacock Parade", and the "Purple Plush" ones, are in their new respective homes, as they became Christmas gifts. 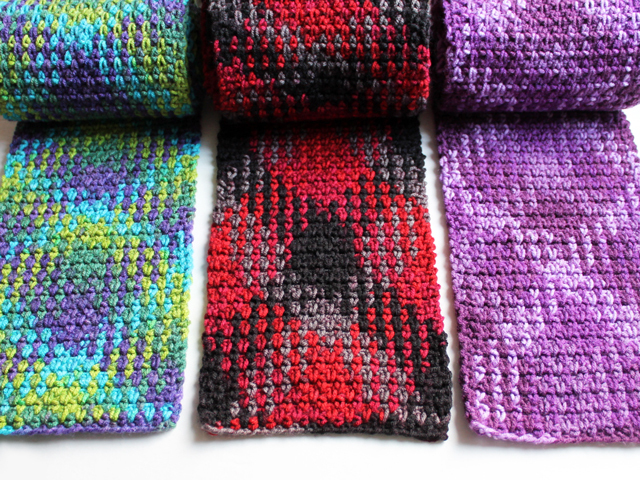 Each one was fashioned into a different style of scarf, and each has an added hat/headband to go with it (not created with this same yarn). I'll be back over the next few weeks to show you the completed projects, but, fear-not non-crocheters ;) , I have other, more universal, things to show you in between! Oh wow, i haven’t seen that before, but it looks amazing!! 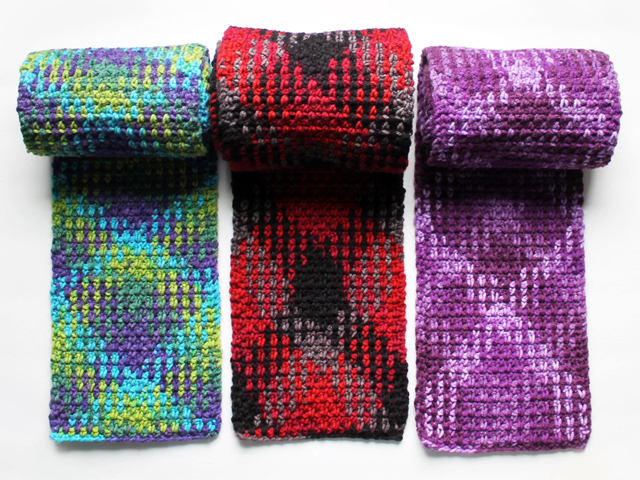 I love how your scarves have worked out, and they look so good! Thanks, Julie! They are pretty amazing yarns. I’d never seen anything like them before either. There are so many different colour combinations and the element of surprise with the ones I’ve tried has been so fun. Now I have the urge to try all the colourways, to see what each will look like. Looks like we’re in for an extended period of heavy snow and ice, so I guess I have plenty of time to hibernate and crochet!! Hi Debbie. Thank you for your note. If you mean making a wider piece of fabric using this same yarn, which will have a repeating tartan pattern, I tried and tried to figure out how to do that with zero luck. It seems like it should be doable but I was unable to get it going, and after many swatches, gave up on it. Or, if this company makes another pooling yarn that’s specifically meant to make a baby blanket, I’ve not seen that, so have no insight. Sorry I can’t be more helpful.